Centennials always come with a fair amount of celebration, and the same can be said for Yamazaki Mazak, Mazak Optonics Corp.’s parent company, which reached that illustrious milestone this year. And while the company began as a straw mat machine manufacturer, Yamazaki Mazak and its subsidiaries are producing some of the most advanced laser cutting systems on the market, including Mazak Optonics’ Fabri Gear line of 3-D tube cutting systems. 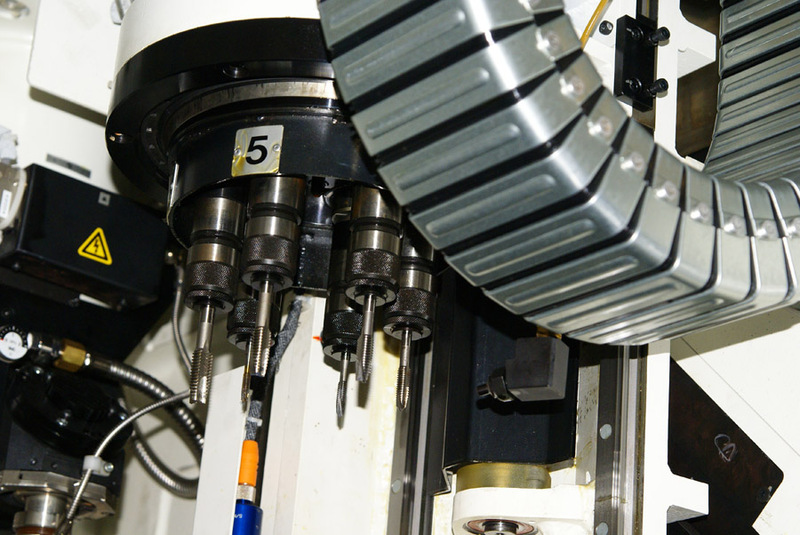 Within a decade of its founding, Yamazaki Mazak began to develop its first commercial machine tool. The company landed in the United States in 1968, and by 1983, it was in the laser business, eventually establishing itself as Mazak Optonics, a pioneer in integrating resonator-based laser cutting machines. The evolution continued through the 1980s, 1990s and early 2000s as engineers fine tuned laser cutting technology through constant beam-based laser delivery systems and one-pass load/unload automation systems. 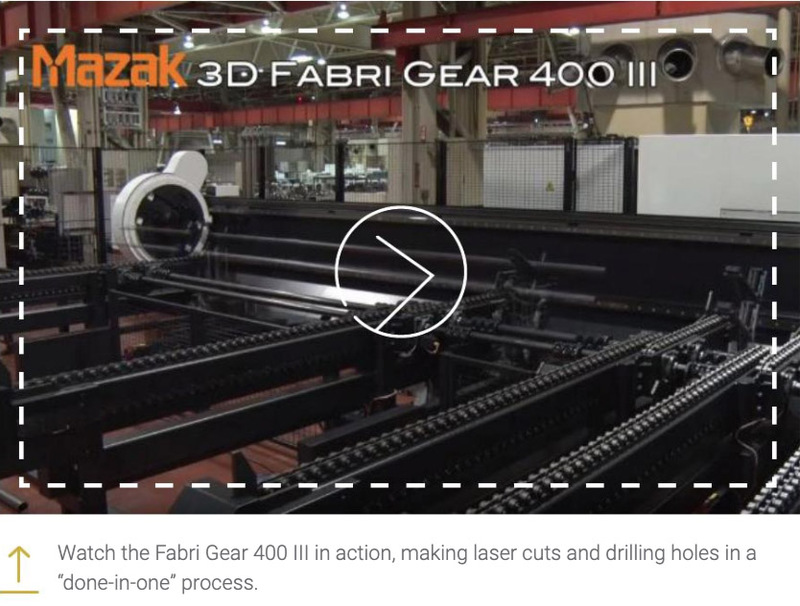 Mazak Optonics’ Fabri Gear line of 3-D tube cutting systems can process material up to nearly 50 ft. in length, utilizing a four-chuck system for exceptional control. Mazak Optonics also made its mark in the development of unique 3-D laser cutting systems, including the Fabri Gear line, which was introduced in 1999. Since its introduction, it has continued to evolve with new engineered technologies, such as its proprietary 3-D cutting head that maximizes flexibility and reduces the time for secondary processes. This 3-D range of movement expands the range of applications for which the Fabri Gear is suited. 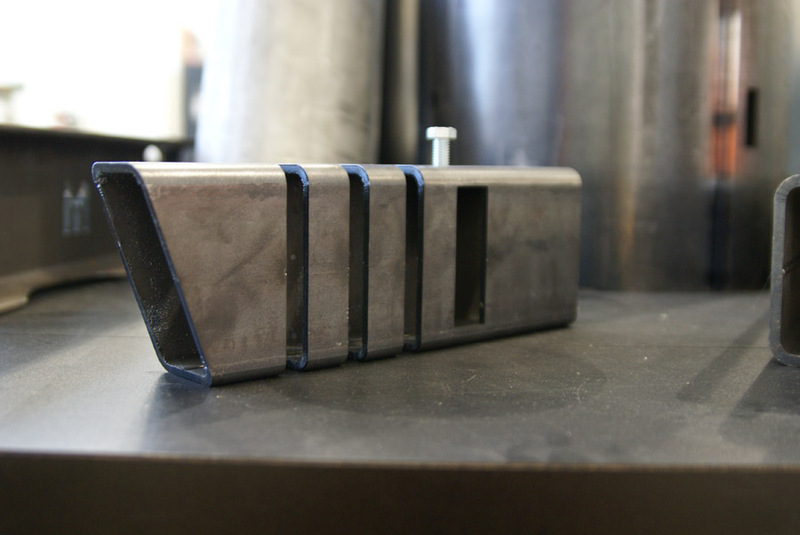 Users can cut any desired angle for weld prep, plus achieve the highest accuracy for easy fit-up of assemblies. The Fabri Gear line includes the Fabri Gear 220 III and the Fabri Gear 400 III. Both feature a six-axis laser available in a 2.5-kW or 4-kW resonator. They can handle the same length of material (maxing out at nearly 50 ft. or 590.5 in. ), but the 400 processes rounds up to 16 in. compared to the 220’s 8.6-in. rounds. Among the first tube laser machines on the market, the Fabri Gear line instantly stood out. Its four-chuck system, which allows it to fully control the raw material and the finished part throughout the process, is one of many attention-grabbing components. While a chuck, a specialized clamp used to hold material entering and exiting the machine, isn’t unique to Mazak, the number utilized serves as the differentiator. Thanks to 3-D laser control, the Fabri Gear line can make complicated beveled cuts. The four-chuck design is ideal for processing structural materials, which are used in building structures, HVAC systems, and cranes, among many others. Although the four-chuck design simplifies the process of making parts out of structural materials, there are still challenges. For example, anyone who has worked with structural materials can attest to the fact that the raw material isn’t always consistent, as it can be bowed, twisted or misshapen. Any of these issues can pose a challenge in making accurate parts. Van Wyhe says it is crucial to have the Fabri Gear work and function as a full system. 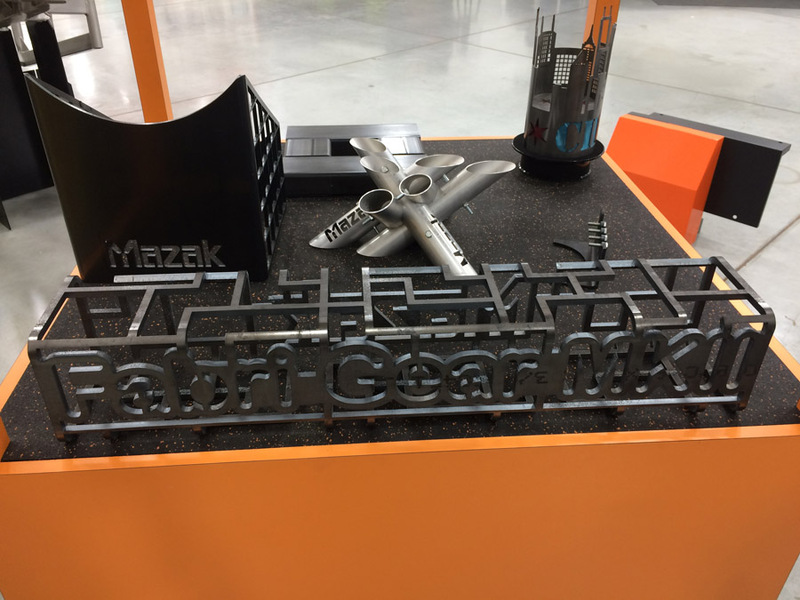 For example, Mazak leverages automation to load material, cut parts via the 3-D laser, tap and chamfer holes (optional capability), and unload finished parts with little to no wait time from simultaneous operations. Examples of what’s capable with a 3-D laser on a variety of material types. Thermo Energy Systems, an Ontario, Canada-based company serving the greenhouse market, invested in the Fabri Gear 400 to replace mechanical dies and punches that had been previously used, each of which involved multi-step operations. Companies with mechanical dies and punches often have to cut material to length on a saw, then move the material to a drill station for adding holes. Some processes might also require the use of a hand plasma cutting tool. Other companies in the transportation, building construction and utilities industries, such as Marcon Metalfab, another Canadian company, also take advantage of laser systems like the Fabri Gear. Company representatives were actually in search of an automated saw to speed up the production of guardrails, but once they saw what the Fabri Gear line could do, they switched lanes knowing they could be much more efficient. “Some customers are surprised to see how technology like the Fabri Gear can improve a part or process compared to what they currently do,” Van Wyhe says. “Better yet, there are many times that it can improve the part and process as well as the assembly of their entire product line. End users can outfit the Fabri Gear machine with up to six different taps, which gives the machine “done-in-one” capabilities. Not every laser cutting machine on the market is going to be built with tapping and beveling capabilities, which is part of what makes the Fabri Gear line unique. Up to six taps can be set up in the machine. 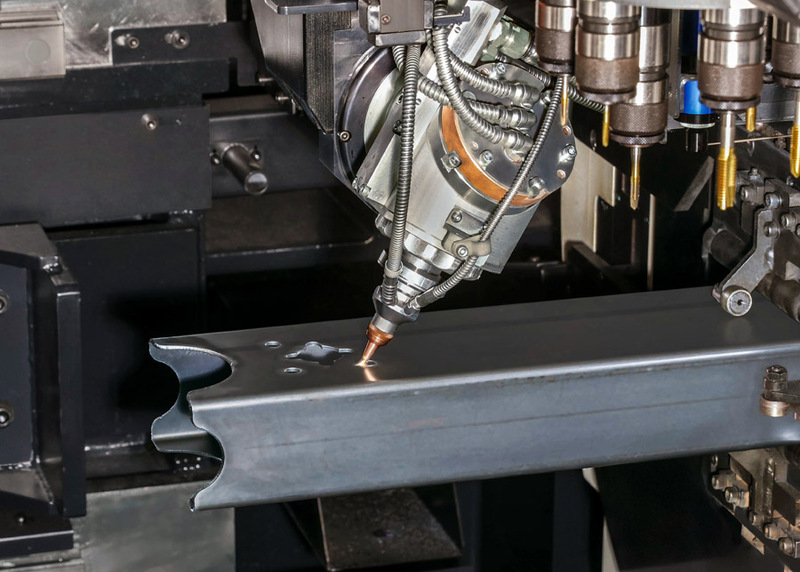 And, because it features a six-axis laser head, it can do 3-D geometry shapes, cutting everything from beveled and mitered end cuts to countersink holes. Other important features include a measuring system that automatically measures material length via a sensor, and a separate sensor in the cutting area that measures the material and compensates for distortion. Furthermore, after a part is finished, the chuck system automatically unloads it into a specified area. Notice the bolt at the top, a feature that helps shops reduce secondary work by including drilling/tapping technology on the machine. Mazak not only is an innovator in 3-D laser cutting but also in laser generators. In 2016, Mazak introduced its breakthrough direct-diode laser (DDL) platform. 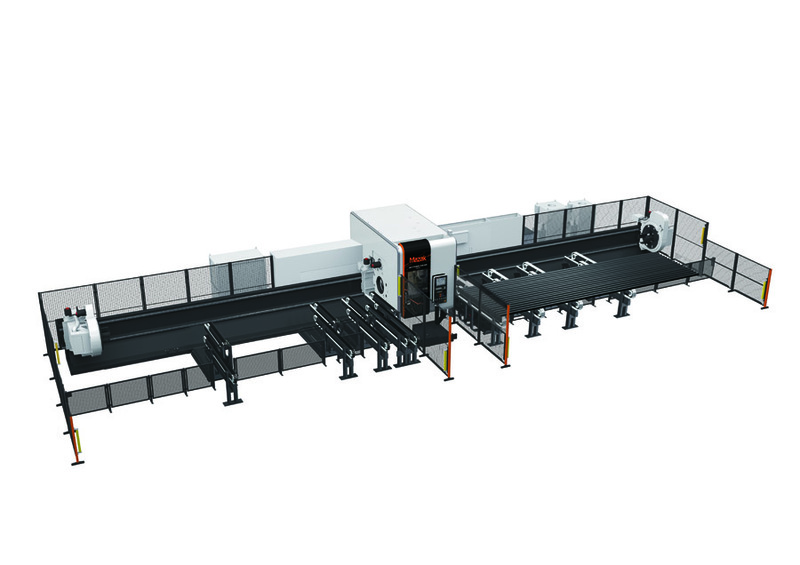 This next-generation laser source will soon be launched in Mazak’s next-generation of Fabri Gear machine, the FG-220 DDL. This machine utilizes DDL to deliver higher performance and reliability over CO2, traditional fiber and other solid-state laser generation systems. The Mazak DDL generator offers 45 percent more energy efficiency compared to previous laser sources. It also allows for higher energy absorption rates and increased power density. Comparing the modes, or beam diameter, the DDL has a 40 percent increase in power density over fiber. This is thanks to a smaller beam diameter that is able to offer more intense light, which ultimately increases cutting speed. The smaller beam diameter also creates a reduced heat-affected zone, in part because the DDL beam is a 10th the size of a CO2 beam and because its cutting speeds are faster. Both of these beam characteristics result in less heat needed to cut the material and less time that the edge of the material is being touched by the laser’s extreme heat.